1Q: Tell us a little about the origins of NOTHING IN LOS ANGELES, from concept to financing. Alexander: Having been trained as a composer, I wanted to write a script that showcased my music. I had never written a screenplay before so I thought I had nothing to lose. Being in a town where everybody wants to write one, I decided the hardest part was just sitting down and writing one. That’s how “Nothing in Los Angeles” was conceived. We used Kickstarter as a way to get initial funding but an old family friend, Armand Hargett, came on board and loved the idea. Rob: The brilliant script and origin of the vision all came from Alex. I was more than eager to hop on board once I saw the potential for greatness in the project. I’m so grateful that Alex trusted me enough to let me join in the fun and help steer this ship. None of it would have been possible without the faith of our Executive Producer Armand Hargett. He understood the type of film that Alex had written and thank goodness he wanted to see it made. 2Q: NOTHING IN LOS ANGELES has done quite well at other film festivals. Will you be less nervous now at Cinequest? Does this process ever get any easier? Alexander: I think instead of nerves, there will be excitement for both of us. The hard work is done and now we should take the time to enjoy what we’ve done and hope other people take a liking to it. Rob: For me, watching the film with a crowd has definitely gotten easier since being honored with a few awards. The first time we screened it for anyone I was scared out of my mind. I knew I thought it was good, but I had no clue how our style of humor would translate. Just knowing that someone besides the two of us likes it at all is quite comforting. It means a lot for us to be at Cinequest, so we hope it continues to play well. 3Q: What was your best and/or worst experience while making NOTHING IN LOS ANGELES? Alexander: The best experience was editing the film and putting it all together with the music. Editing is really where the fun part comes in because you’re seeing the film evolve as opposed to just rough dailies. The hardest part for me was wearing so many different hats (co-producing, co-directing, acting, and memorizing my lines). Having never acted, I needed to trust the actors around me and in particular, Rob, who gave me a tremendous amount of guidance and support. Rob: My favorite part is being on set, building camaraderie with the crew and getting to support the actors’ performances as a director. I’ve never before been excited to have to wake up before dawn. I also had a ton of fun with my own time on screen, and actually really enjoyed the challenge of getting to wear a few hats on set. The hardest was getting over anxiety as to whether or not it would all line up in the edit. We’re all pretty inexperienced with filmmaking, so we were just doing our best. Having Alex and Danny Belinkie, our awesome DP, really made the difference. We each brought a different thing to the table and each covered for the others’ shortcomings. Alexander: They should see it because despite having a good story, it’s filled with laughter, sentiment, silliness, and serious moments. It’s shot beautifully and shows LA like no other film. Rob: I think the struggles of our main character are those that almost everyone can relate to. There is a realness to some of the awkward moments throughout the film and that kind of comedy is really charming in its sincerity. We do showcase a lot of the beauty of the city. If you like Woody Allen, I think you’ll enjoy yourself. 5Q: Time to pre-plan: You just won an Oscar for NOTHING IN LOS ANGELES. Give us your acceptance speech. Alexander and Rob: The making of this film was about trust. We had an extremely small team, so we had to really trust each other. But more than anything we had to trust ourselves. A little bit of encouragement from your teammates can go a really long way. We consistently gave each other positive feedback and I don’t think we’d be here today having not created that habit on and off set. If you keep people believing in themselves, there’s nothing they can’t do. Thank you to everyone who continues to help me believe in myself. 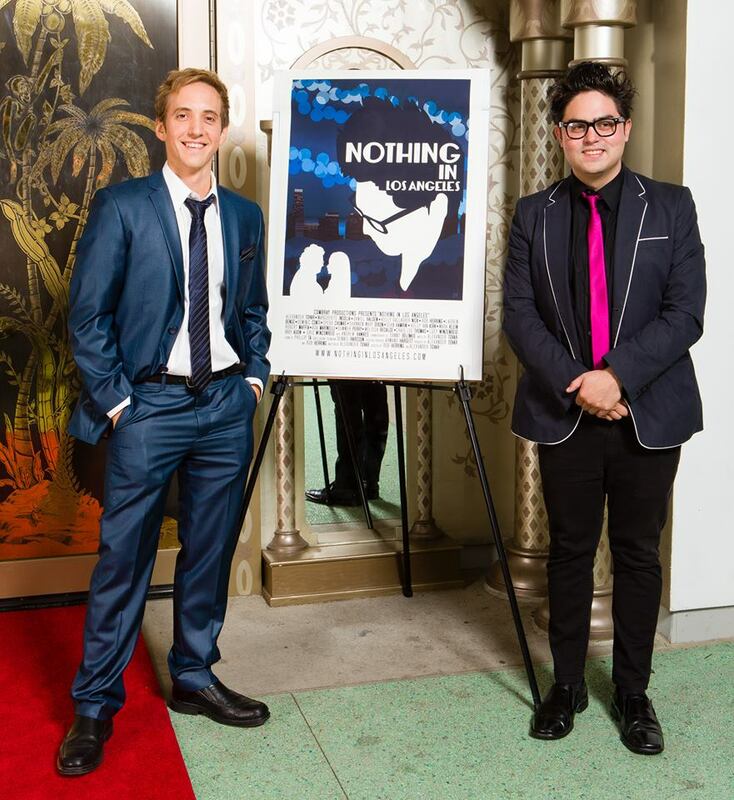 See NOTHING IN LOS ANGELES at Cinequest!